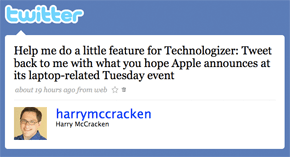 Twitter Chatter: What Are We Hoping Apple Announces on Tuesday? This we know for sure: Apple is having an event next Tuesday, and it will involve notebooks. Possibly sub-$800 notebooks and/or notebooks carved out of solid blocks of aluminum. But really, Apple being Apple, it could announce almost anything on Tuesday–multiple anythings, even. So over on Twitter, I asked my pals to chime in with their what they were hoping for–and since it was Twitter, they had to do it in a maximum of forty characters. wardomatic: Affordable (yet fast) Macbooks, please. amarvin: i hope apple announces a 13-inch aluminum macbook but keeps the current macbooks as entry-level (cheaper) models. dtnick: A MacBook that doesn’t crack. Is that too much to ask from them? randypeterman: I would like Apple to announce a Mac Basic [$799], a Mac Book+ [$1199] & a MBP Upgrade for $1799. strixus: not a laptop. New Mini. ugadawg94: I want a 15 inch MacBook. CallanH: I hope the $800 laptop rumors are true. I know many people who would be into that. pcubed: really hope for a high-end netbook, like an Air for the rest of us. Somewhere in the $650 range would be optimal. And hey, if you want to follow me on Twitter, please do! I go by the cryptic handle of harrymccracken there. There’s good news–sort of!–from Bentonville: Walmart.com, which had told folks who bought copy-protected music that it was shutting down the DRM servers that let them move their tunes from device to device, has relented. At least for the moment. Ars Technica has details, along with some good background on previous instances of big companies who gave up on DRM. In almost every case, they only made an effort to make their customers happy in the wake of a consumer backlash against their original plans. I put “buyers” in quotes in the headline for this post because every time an entertainment merchant decides that maintaining DRM servers isn’t worth the hassle, it’s new evidence of an important point: When you buy anything that can be disabled or hobbled remotely, you didn’t really buy it. You’re just leasing it for an unspecified period. Wal-Mart’s change of heart means that period isn’t ending immediately for its customers, but it will end, apparently…and when it does, I think the right thing would still be for the company to give its customers their money back. For a long time, Zoho has been the most ambitious provider of Web apps around when it came to the sheer variety of services it offered–from a word processor, spreadsheet, and presentation tool to stuff for invoicing, HR functions, and project management. Bu there’s one app that’s so obvious that I somehow hadn’t noticed that the company didn’t offer it–and that was e-mail. Way back last spring, when I still worked at PC World, we received a visit from RIM co-CEO Mike Lazaridis. He showed us the company’s next-generation smartphone, the BlackBerry Bold. And I got really excited. The Bold had one of the best screens I’d ever seen–one which, in terms of dpi, offered far more resolution for its size than the iPhone display. It had an updated user interface, media apps, and a new browser. It was the first 3G GSM BlackBerry. The keyboard looked excellent. In terms of aesthetics, it was a stylin’ little gadget (except, maybe, for its “leatherette” backside). All in all, it looked terrific–I thought it probably was the second most interesting smartphone of the year after the second-generation iPhone (whose name we didn’t know yet). And for folks who like little plastic keys, it looked like the most interesting phone. I looked forward to AT&T rolling it out–and at the time, it sounded like that would happen at roughly the same time that the new iPhone made its debut. Hey, Let’s Build an $800 MacBook! With new Apple portables due next week, I’ll need to update my assessment. Whatever Apple announces, it’ll change the comparison at least a little–and it seems a dead certainty that any new models will sport more RAM, larger hard drives, and faster CPUs than the ones they replace. From a pure price standpoint, the most interesting rumor about next week’s news is that it will include an $800 MacBook, which would be the cheapest Apple portable ever. (Current MacBooks start at $1099.) It’s an entirely plausible idea, and while that doesn’t mean it’ll turn out to be true, it got me to thinking about what a machine might be like. So why don’t we try to configure it, spec by spec? I’ve just delved into a pretty exhaustive detailing of all that’s unsatisfactory about Windows Vista’s User Account Control (UAC), the security measure that’s famous for asking you if you want to perform the task you just said you wanted to perform. And the funny thing is, I did so at Engineering Windows 7, Microsoft’s official blog about the next version of its operating system. The post is by Microsoft’s Ben Fathi, and while it’s understandably somewhat defensive about UAC–it says that it’s less obtrusive today than when Vista debuted, for instance–it also acknowledges that UAC is annoying and confusing, and that the tendency of many folks to click to allow actions without thinking about it impacts its ability to protect users against unauthorized actions.